At Pain Physicians NY (Brooklyn, Queens, Bronx, Manhattan NYC) hip pain management doctors and specialists effectively treat Bursitis pain. We always consider a non-invasive treatment options first before we turn to more invasive, removing the bursa or make an incision through the skin in order to drain the fluid of the bursa. We effectively treat Bursitis in Brooklyn using the latest cutting edge advanced methods and technics. Brooklyn hip pain management specialists are selected to be a part of the international medical team for the Rio Olympic Games. The bursa is a sac filled with synovial fluid and is found in most major joints in the body. Found between bones and tendons, the bursa provides a cushion around the joint, preventing friction between bones and allowing smooth movement of the joint. Bursitis occurs when the bursa becomes inflamed and makes the joint movement painful and very difficult. The hip is one of the major joints in the body, connecting the femur of the leg to the torso. There are two bursa’s for each leg one on the outside of the hip, known as the greater trochanteric bursa, and one closer to the groin, known as the iliopsoas bursa. 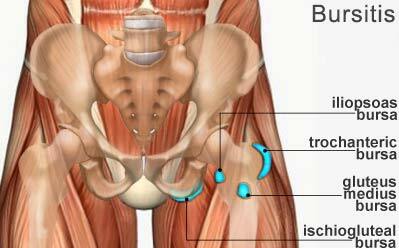 The iliopsoas bursa is less affected by an inflammation when compared to the trochanteric bursa. However if the iliopsoas bursa gets affected, the condition is referred to as bursitis of the hip. Bursitis of the hip is usually noted by pain around the hip, especially around the groin area. The pain is usually aggravated when lying on the affected side or standing up after a sitting for a long time. How Is Bursitis Of The Hip Treated? Before even starting the treatment, it’s important to determine whether the bursa is infected or just inflamed. This will help your health care provider determine the necessary treatment. Resting – try to avoid moving the hip joint as much as possible, which means that you should avoid walking as much as you can. While resting, do not overexert the affected bursa, which means lying on your left side if the right bursa is affected. Provide further cushioning to the joint using extra pillows. Ice – ice packs can help reduce inflammation of the bursa, so wrap some ice packs or frozen vegetables in a towel and apply to the affected bursa for 10-20 minutes. Keep doing this every few hours until the swelling goes down. Painkillers – constant pain can make you restless and lead you to aggravate the injury. Common painkillers like Aspirin and Ibuprofen can help make you comfortable. Other anti-inflammatory drugs can help reduce the swelling. Antibiotics – After the diagnosis, doctors will often prescribe antibiotics if the bursitis is septic. They will usually be in tablet or capsule form, and after several days of the medication, the doctor should check whether the infection seems to be going down. Corticosteroids – If bursitis doesn’t respond to antibiotics, corticosteroids can be injected directly into the affected area. They contain steroids that can be used to reduce inflammation. Aspiration – If the infection is severe, it may be advisable to have the fluid drained out. It may take a few days for your body to recover but it improves movement thereafter. Surgery – When all the other treatment options fail, a surgery may be done to completely remove the bursa or make an incision through the skin in order to drain the fluid of the bursa.